September 23, 1976: at the Walnut Street Theatre in Philadelphia, PA.
October 6, 1976: at the Palace of Fine Arts Theatre in San Francisco, CA. October 22, 1976: on the campus of the College of William and Mary in Williamsburg, VA.
Gerald Ford: Favors constitutional amendment to outlaw abortion. Jimmy Carter: Minimize abortions, but no constitutional amendment. Gerald Ford: Tax cuts are the best way to stimulate the economy. Jimmy Carter: Balance budget by shifting taxes and employing people. Jimmy Carter: Balance budget by 1981 by zero-based assessments. Jimmy Carter: Civil rights act was greatest thing ever for the South. Jimmy Carter: GOP tax policy is welfare for the rich. Gerald Ford: OpEd: School segregation has increased in the Northeast. Gerald Ford: Favors constitutional amendment for voluntary school prayer. Gerald Ford: Increase federal spending on education, but not by $30B. Gerald Ford: Strip mining & high emissions OK if labor & management agree. Jimmy Carter: Energy policy needed to avoid kowtowing to oil countries. Gerald Ford: Need more oil and gas production in comprehensive program. Jimmy Carter: Develop a varied energy portfolio, including solar. Gerald Ford: OpEd: consistently reduced pollution enforcement. Jimmy Carter: Treat Arab oil embargo like declaring economic war. Jimmy Carter: US needs to regain respect in UN and with our allies. Jimmy Carter: Supports complete moratorium on nuclear weapon testing. Gerald Ford: Cutting defense negatively impacts economy and jobs. Gerald Ford: Gun registration does not reduce crime; focus on misuse. Gerald Ford: Give draft evaders opportunity to earn their records back. Jimmy Carter: Would pardon draft evaders outright to heal nation. Jimmy Carter: Voluntary price restraints to put our people back to work. Gerald Ford: North Vietnam must account for US MIAs or bar from UN. Jimmy Carter: Put the people and US allies back into foreign policy debate. Jimmy Carter: Return to values of Constitution and be open with the people. Jimmy Carter: Constitution & Bill of Rights should guide foreign policy. Jimmy Carter: Return to values to regain role as world's moral beacon. Jimmy Carter: The greatness of America can be restored. Gerald Ford: Cutting federal spending justifies tax cuts. Jimmy Carter: No US war in Yugoslavia even if Soviet Union sent in troops. Gerald Ford: Urban policy: $6B in revenue sharing for cities & states. 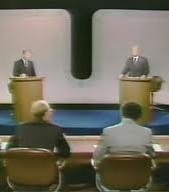 The above quotations are from The Carter-Ford Presidential Debates, Sept.-Oct. 1976.